Where Can I Use Table Pads? Choose your table shape below to view or print specific instructions and tips. If you need help, call our experts at 1-800-541-0271. How many insert leaves does your table have? Note: colors viewed on electronic displays can vary. Fabric Snug-Locks are velour strips that act like Velcro under the pad. Dura-Locks are latches hidden along the abutting sections of your table pad. Please choose a shape and number of leaves in Step 1 first. Questions? Call us at 1-800-541-0271. Tip: scroll down for rules for measuring. To get a final price for seven or more insert leaves, you must call us at 1-800-541-0271. What shape do the drop leaves have? Sharp square corners: all we need are the measurements above. Round corners: you must either determine the radius of one corner by printing and using our Corner Radius Guide, or you can leave the radius blank and make a paper pattern. Any other shape: a pattern may be needed. To find out and get directions, please call us before you order at 1-800-541-0271. I used the printed guide, and the corners are exactly 45°. Add a buffet, server or sideboard? If you have not called to verify that we have your table model number on file, then you will need to mail us a paper pattern of your table. If your table and leaves are perfectly rectangular, with sharp square corners, we do not need a pattern. If your table is any other shape, a pattern may be needed. To find out and get directions, please call us before you order at 1-800-541-0271. Are you mailing us a paper pattern? Yes. I will enclose my name and phone number. No. I used the printed guide to find the size of the corners. No. I called to verify that you have my table model number. Measure using only a flexible metal tape, not cloth or wood: they are not accurate. Measure the flat top surface only. 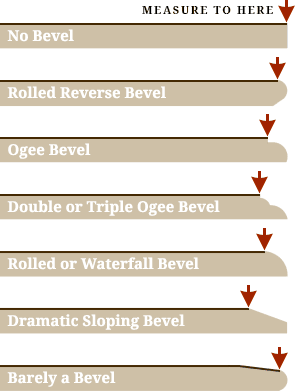 Do not include any lip, bevel, rolled or sloping edges. How do I know what to measure? Important: If your table is square or rectangular with rounded corners, a pattern is needed. Remember that rounded corners can have different sizes, from very small like a dime to very large like a basketball rim. Either way, rounded corners require you to make a pattern: choose a new shape, “Rectangle with rounded corners,” and then instructions on “How to Make a Pattern” will appear here. 80% of tables thought to be round are not true perfect circles. In order to give you the best fit, we would like you to measure the width and length. 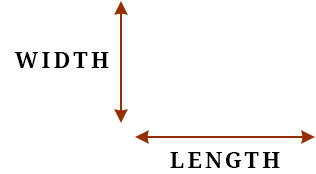 In our industry we consider the width to be along the split, and the length to be opposite or perpendicular to the split. If your round table has no split, we would still like you to measure in two directions: pick one direction to be the width (for instance, following the grain) and then the opposite or perpendicular direction is the length. If the width and length are off by even 1/8ʺ, we want to know. We draw round table pads with a giant compass and we will make this adjustment. Important: If your buffet is square or rectangular with rounded corners, a pattern is needed. Remember that rounded corners can have different sizes, from very small like a dime to very large like a basketball rim. Either way, rounded corners require you to make a pattern: choose a new shape, “Other shaped buffet,” and then instructions on “How to Make a Pattern” will appear here. The main objective in making pads for a dropleaf table is to maintain versatility. This means we usually make one pad for each drop leaf, and a separate pad for the center section. On some dropleaf tables, the center section is solid. On others, it separates and opens for insert leaves, so we make a separate pad for each insert leaf. Important: If your dropleaf table is oval, rectangular with rounded corners, or any other non-rectangular shape, a pattern is needed. Remember that rounded corners can have different sizes, from very small like a dime to very large like a basketball rim. All of these shapes require you to make a pattern as instructed below. Important: If your harvest dropleaf table is square or rectangular with rounded corners, or any other non-rectangular shape, a pattern is needed. Remember that rounded corners can have different sizes, from very small like a dime to very large like a basketball rim. Either way, rounded corners require you to make a pattern as instructed below. When leaves slide into the ends, they do not usually fit flush. This is because the leaves and the main table have been finished with a bevel on all four sides, creating a “V” or gap that we need to account for. That is why it is important to measure only the flat top surface of each section, and why we ask for the length of the table without leaves above. Please call us at 1-800-541-0271 so we can do the math and explain how we will accommodate the gap. We also ask for the size of each leaf if you include leaves in your order: do not assume the leaves are the same. Important: If your refectory table is square or rectangular with rounded corners, or any other non-rectangular shape, a pattern is needed. Remember that rounded corners can have different sizes, from very small like a dime to very large like a basketball rim. Either way, rounded corners require you to make a pattern as instructed below. Please follow these directions carefully. The fit of your table pad can only be as nice as your pattern and as accurate as your measurements. Please do not hesitate to call 1-800-541-0271 before getting started if you have any questions. You can also request our free brochure, which includes a large piece of template paper and a postage paid return envelope. Open our template paper and flatten it out. If you are using your own paper, brown shipping or wrapping paper works perfectly. Make a pattern of just one half of your table. If our template paper does not completely cover half, add to it by adding your own paper, or give us a call. Line up the edge of the template paper exactly on the center split of the table. If your table has no center split, we need a pattern of the complete top. For servers or buffets, line up the paper with the back edge. Use phone books or heavy objects to hold the pattern still. Tip #1 The point of the pencil should be pointing towards the table, not towards the floor. Tip #2 Hold the pencil as parallel as possible to the flat surface. Do not hold the pencil like a rocket ship. Do not for any reason cut the pattern to get it into the envelope; just fold it again. Make a pattern of just one drop leaf. Line up the edge of the template paper with the seam or crack, where the drop leaf meets the center. Only make a pattern of the center section if it is not rectangular in shape. To finalize the price, you must take measurements. See instructions in Step 4. To finalize the price, you must take measurements. If you have not called to verify that we have your table model number on file, you must either use our printable corner guide or make a pattern. See instructions in Step 4. To finalize the price, you must take measurements. If you have not called to verify that we have your table model number on file, you must also make a pattern. See instructions in Step 4. To finalize the price, you must take measurements. If you have not called to verify that we have your buffet model number on file, and if your table is not a rectangle with round corners, you must also make a pattern. See instructions in Step 4. To finalize the price, you must take measurements. If your table isn’t a rectangle with square or round corners, you may also need to make a pattern. See instructions in Step 4. To finalize the price, you must take measurements. If your table isn’t a rectangle with sharp square corners, you may also need to make a pattern. See instructions in Step 4. When shipping outside the continental U.S. or to APO/FPO, please call for a quote. Visit PioneerTablePads.com to Get a Quote instantly or view Prices at a Glance. + Table pad storage bag? To place an order, visit our Order page or call 1-800-541-0271. Share a photo of your table pad—we’d love to see it!